Being a teenager means that someone is not yet fully developed its maturity, and the character while it has grown and starting to take form, we know it needs to reach its completion too. In teenagers and children, it is very important to impress the meaning of why we need to adopt moral values in our lives. Without them, society could not sustain in a civilized world and communities will destroy themselves as soon as the moral values disappear from it. Now, having these values integrated into our way of thinking and way of conducting ourselves in the world is better known as having a “Moral Compass”. What Having A Moral Compass Really Means To Each One Of Us? We already know that the Moral Compass is called this because it gives us a direction to follow by behaving with the moral principles comprehended. It’s the consciousness of doing good or bad, being right or wrong, walking in light or walking in darkness. When you lie to someone about something (no matter the reason) how do you feel about yourself? Would you be proud and see yourself as someone reliable by cheating on your significant other? How would you feel if your friend or a relative find out that you took some money from him/her? Deep very deep down, and I mean really deep down we all know that by doing these kinds of dishonest things we see ourselves as someone toxic and our self-esteem and self-confidence suffer dramatically. In other words, immoral people know what they’re doing is bad and hate what they see in front of a mirror. Everything said here has been great and I hope you’re getting the idea… but how all of this can help me to fight and cure my depression? Probably now it’s really simple for some of you to see it, but I’ll finish the idea anyway. By behaving in “the light” and doing the best we can do with our ability right where we are, in a certain way what we really are doing is following the God’s commandment of “do unto others as you’d like being done to you” hence you are loving your neighbor as much as you love yourself! This is in the more external and societal way of speaking, now let’s see it in a more personal way. Depression and anxiety is the condition that won’t let you follow this commandment because you think and feel like you’re not worthy of love. This is the upper hand it has over us and lastly, it is the triumph card too if we believe we’re not worthy. 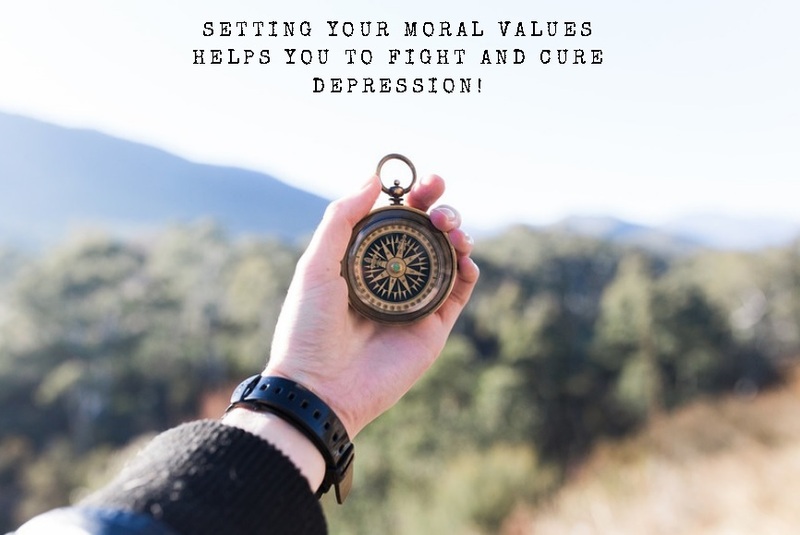 The actual way that moral values fight and can cure depression is because when you behave with morality you’re creating the self-image of someone who values who it is! And this is of huge importance because by doing this our true self-confidence and true self-esteem skyrocket to whole new levels! Even if you don’t feel and think that you’re a valuable person worthy of love and care you need to act as if you are (you really are) and setting a moral compass of righteousness will help you in developing the right mindset and the right emotions of worthiness, love, and care!